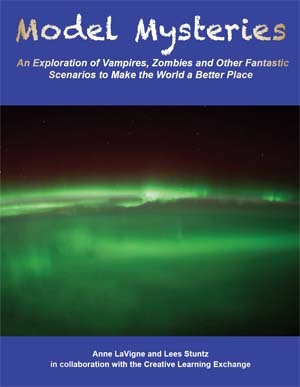 If you’re interested in thinking about how to solve mysteries and like the idea of creating computer models and applying them to real-world problems, this book is for you. You can use it independently as a student, work with a group of students, or if you’re a teacher, share it with interested students to complete a guided or independent study. How can zombie chickens taking over the world be similar to a growing national debt or the possible extinction of an endangered species? How can the distribution of a new mind-control technology be similar to working toward a goal, like improving your grades? How can vampires spreading throughout a big city be similar to the spread of a new deadly disease? These and other included explorations are about deriving helpful answers, but the REAL point is to see how the underlying system works. As an example, if we were talking about automobiles, one set of lessons is to learn how to drive a car, but another – deeper – set of instructions is how to build and maintain an automobile. In the following chapters, we are going to be looking “underneath the hood” of each model. Also, it’s important for us all to recognize that no model is ever going to be perfect, but model makers know that, and they continuously work to improve them to make them behave closer to how things work in the real world. As you use this book, your understanding of systems in general and these systems in particular will increase. If our understanding of systems expands, the hope is we’ll also make decisions that result in a better world for all. Now that you’ve downloaded the book, you’re probably wondering what to do next. The first step is to gain access to some modeling software, so you can build your own models! Stella Online is one free option that’s described in the book. By registering with the CLE, you can get a special edition of Stella Online that will allow you to create one extended model. You’ll need this since the limited free version only allows you to build models with 12 or fewer elements; some models in the book contain more than 12 elements. Please enter your email below. If you have not previously been registered with the CLE, you will be prompted to enter more information. Otherwise, your information will be set to isee systems for enrollment in the Stella Online CLE Extended group. Register for an isee Exchange account. If you already have an account, skip to step 2. You will receive a confirmation email from isee systems that your account is ready to go. Note: You can only have one extended model at a time, so make sure to use it to build a larger model, such as the one in Chapter 5. Don’t delete this model, or you’ll lose access to that ability. If you want to build another large model, erase the elements inside the extended model, and start again from scratch. As you build the models in the book, you might want or need to check your work. All of the main models and some of the extended models are available online for that purpose.